Don’t faints seem mysterious? It’s as if your computer crashed and had to reboot. Although we never seemingly figure out why computers are so crazy, fainting (syncope) is reducible to a common denominator: something causes a decrease in blood flow to your brain. Recall that oxygen and other needed nutrients are carried in blood, so even a temporary stoppage or shortage of blood flow shuts things down. Now extrapolate that to strokes and comas, which are often due to serious and prolonged causes of blockage to the blood vessels supplying the brain. This is a prime example of why good blood flow and good health are so important. The brain is a highly efficient, oxygen and energy-guzzling organ. Shut it down for even a few seconds, and bad things start to happen. Consider fainting a warning sign. I’m going to start by offering some Quick Tips to help if you find yourself around someone who has fainted. Then, I will get into the weeds of why these things happen for those interested. I’m doing this so you can check these and determine where your risks may be. Call 911. Make sure the person is still breathing and has a pulse. If not, start CPR. Loosen clothing, especially around the neck. Elevate the legs above the level of the chest. If the fainter vomited, turn him/her to the side to help avoid choking and food going down the airway (aspiration). 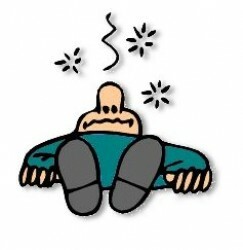 A diabetic may have been given instructions to eat or drink something if s/he feels as if s/he is going to faint. If you know this, a faint would be a good time to administer any glucose gel or supplies advised by a physician. Prompt treatment of low blood sugar reactions is a life-saver. Discuss and coordinate how you can perform this effort on behalf of your friends and family with their physicians. If it’s possible that the faint is part of some heat emergency (heat exhaustion or heat stroke). Actually, faints are caused by all kinds of medical problems. I list a few notable causes below, but whether the front end difficulty is with the heart pumping, the nerves conducting, or the content of oxygen or energy being delivered, the end result is the same. Decreased nerve tone (vasovagal syncope): This is the most common cause of faints, and contrary to what you might think, it happens more often in kids and young adults than in the elderly. Understand that your nerves actually regulate blood flow (analogous to a train conductor telling the heart to speed up or pump harder or not). Changes in nerve tone can result in errant signals being sent, transiently resulting in low flow. Diseases and conditions that affect the nervous system and/or ability to regulate blood pressure: Alcoholism, dehydration, diabetes and malnutrition are conditions that may depress the nervous system. Alternatively, coughing, having a bowel movement (especially if straining) and urination may abnormally stimulate the system. In the elderly and those bedridden, simply standing can cause fainting due to difficulty regulating blood pressure. In this case, standing causes a sharp drop in blood pressure. Anemia: A deficiency in blood cells can lead to a deficiency in oxygen delivery to the brain. Arrhythmias (irregular heart beats): Inefficiency in your heartbeat leads to unstable delivery of blood to the brain. Low blood sugar (hypoglycemia): Low energy states can deplete the body of what it needs to operate effectively, leading to low blood flow. Medications (especially those treating high blood pressure): anything that lowers the heart’s ability to vigorously pump blood around the body can leave the brain inadequately supplied, leading to a blackout. Let’s include illicit drugs and alcohol in this category. Panic attacks: Hyperventilation caused by anxiety and panic upset the balance between oxygen and carbon dioxide in the brain, which can lead to fainting spells. Seizures: Here’s a chicken and egg scenario. A prolonged faint can lead to a seizure, and seizures lead to periods of unconsciousness, during and after the seizure. The lack of oxygen is a common denominator.